Aero Tech Designs Men's USA Cycling Windbreaker Jacket Made In USA! 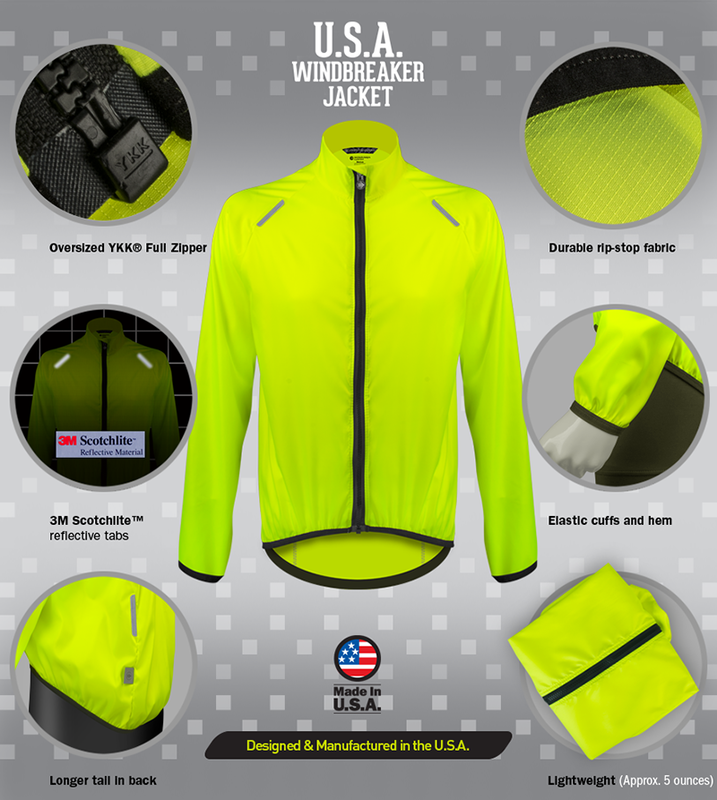 Whether it's night or day, or during bad weather, be seen with this high visibility Men's USA Cycling Windbreaker Jacket, designed and manufactured by Aero Tech Designs in the USA! Created with a high-end, rip-stop fabric, this raglan cut jacket offers durability to keep you riding longer and feeling stronger. The windbreaker uses a Safety Yellow colorway and a total of five 3M Scotchlite reflective tabs for high cyclist visibility. Two of the 3M Scotchlite reflective tabs are positioned at the windbreaker's shoulders like epaulettes, while the other three are located in the back one level at each hip, and a reflective Aero Tech Designs brand tag. Soft elastic is used for the sleeve cuffs and bottom hem for stretchability and cyclist comfort, keeping the jacket in place while also protecting the cyclist from the wind and other weather elements. 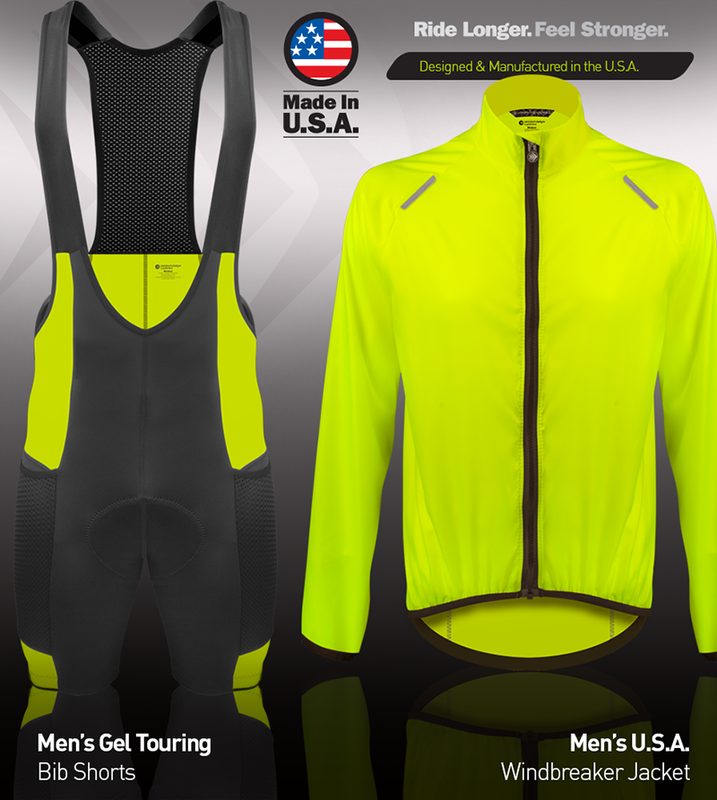 The Men's USA Cycling Windbreaker Jacket is full-zip, with an oversized, sturdy YKK zipper tab for easy use. A zipper garage is included for maximum cyclist comfort with zero abrasions. The windbreaker's long, tapered tail is like that of a bike jersey to protect your back from exposure and splash ups from the road while in the forward cycling position. The raglan cut offers mobility and a comfortable fit while cycling. Easy to pack and super lightweight at 5 ounces, this cycling jacket is perfect for any activity where visibility is needed most! 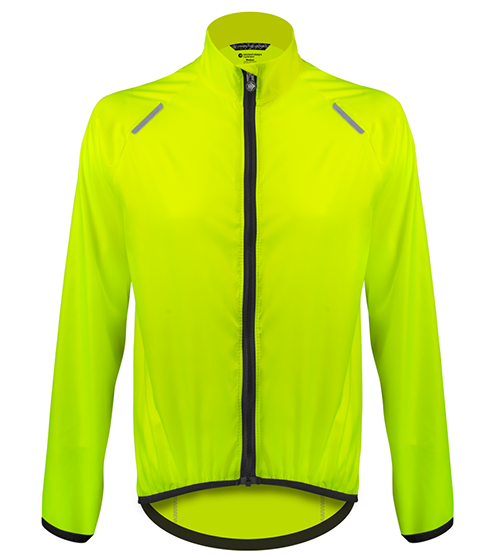 AN ELITE HIGH VISIBILITY CYCLING KIT FOR MEN! Men's USA Cycling Windbreaker Jacket Made in USA! Great value but where do I put my phone? I've had my jacket about a year and love everything about it except no cell phone pocket. I want to buy another for my girlfriend but where does she put her phone? Time to bring these into the modern world. I bought this for my dad, who loves his air bike and has ridden it non-stop for the past 6 years. While the fit is great, it has no pockets! I should have of course double checked prior to ordering. Such a shame as this was not a cheap jacket at all so I really would have expected one pocket. Hopefully he will still use the jacket. Much Better then the previous version..
Great light windbreaker, packs easy, nice and bright and with a decent zipper this time. Works well for me so far between 45-60F and is size is pretty true. Buy this windbreaker and you won't regret it. This may be one of the most practical pieces of clothing to get. Very well made and comfortable. It seems like the trend in the cycling/outdoor apparel industry has been to use the lightest-weight materials at all cost - including major compromises to overall quality, durability, and price. I've lost count of the number of expensive jackets and other articles of clothing that I've had over the years that have zippers that failed after only a year or so of regular use. The bottom line is, I DON'T WANT TO SAVE A FEW GRAMS ON A ZIPPER IF IT MAKES THE WHOLE GARMENT DISPOSABLE. This jacket has the zipper that I wish all of those other things had. It's a sensible, high-quality, U.S.A.-made jacket designed with every-day use by normal people in mind. It would be better with pockets. The full-size zipper is an improvement over the previous model and adding the elastic around the bottom was a good move. But I really miss the pockets -- especially the pouch in the back which doubled as a fold-into and was perfect for holding the phone. I didn't realize how much I had come to rely on the side pockets to hold nose-paper and eyeglass wipes until they weren't there.